While customers wait to see the benefits from smart grid development, microgrid use is growing and offers a near-term alternative of customer control and supply choices that is the promise of the smart grid future. Too often the term smart grid has been equated with the deployment of smart meters making it difficult to understand what benefit optimizing the performance of power grids will mean for customers since the savings seem to be going to reduce utility operating and meter reading costs. The beauty of smart grid is in the eye of the beholder, but so are the fears. An easy way of thinking about the concept of smart grid is to see it as an “upgrade of 20th century power grids” first developed by Thomas Edison, George Westinghouse and Nikola Tesla to distribute electric power from a centralized power generators to many users. When the electric power industry began each generator was its own standalone power grid—its own microgrid, if you will. After the standard of alternating current was established power stations could “interconnect” to serve more customers and back each other up. Over time utilities became “control areas” serving as “dispatchers” of power. Control areas formed into power pools and then regional power grids and then larger regional transmission organizations (RTO). Today, North America has three multi-market “interconnects” or collections of power stations, utility control areas, and RTOs. The transformational change envisioned by smart grid technologies is that the power grids would improve the performance of power grids, reduce congestion, and manage outages by automatically rerouting supply around the problem thus improving both the quality and reliability of electric power services. One of the best applications of new technology is re-creating a very old idea of a microgrid. Microgrid technologies give customers control over their energy strategy and use. Microgrids are to the electric power industry what Amazon and eBay are to retailing, what iPhone was to communications or the Prius was to cars—disruptive technology that changes the value proposition for both customers and energy suppliers. WAKE FOREST, N.C.–(BUSINESS WIRE)—April 11, 2011, PowerSecure International, Inc. (Nasdaq: POWR) announced the commissioning of a state-of-the-art Smart Charging Micro-Grid for the U.S. Army, in a recent ceremony at Wheeler Army Airfield in Hawaii. The breakthrough technology was developed to help the U.S. Army reduce fuel consumption and costs, and improve safety and power reliability at remote U.S. Army locations. Additionally, it incorporates the use of renewable resources, including solar and optional wind power, and enables electric vehicles to be charged by, and provide power to the Micro-Grid system. The technology demonstrated in this system can be applied to power management applications for military field locations. The Smart Charging Micro-Grid provides energy autonomy for facilities in remote locations, improving power availability and reliability. It is designed to enable reductions in the number and sizes of generators required to power facilities, and to control a wide range of generator types, providing significant battlefield flexibility. Additionally, it utilizes advanced energy storage to maximize the use of renewable power resources. The system has the ability to prioritize electrical load to individual receptacles, so the distribution of electricity can be optimized to maximize reliability and optimize fuel efficiency. Importantly, it will improve troop safety because of its ability to reduce fuel consumption and therefore reduce the number of convoys needed to transport fuel. About PowerSecure. PowerSecure International, Inc. is a leading provider of Energy and Smart Grid Solutions to electric utilities, and their commercial, institutional, and industrial customers. PowerSecure’s Energy and Smart Grid Solutions businesses provide products and services in the areas of Energy Efficiency, Interactive Distributed Generation, and Utility Infrastructure. The Company’s Energy Efficiency business provides customers with energy efficient lighting technologies that deliver improved quality of light, including its proprietary EfficientLights® LED lighting products for grocery, drug, and convenience stores, and its SecureLite and PowerLite street lights for utilities and municipalities which are available through its EnergyLite business unit. The Company is a pioneer in developing Interactive Distributed Generation® systems with sophisticated, proactive smart grid capabilities, including the ability to 1) forecast electricity demand and electronically deploy the systems to deliver more efficient, and environmentally friendly power at peak power times, 2) provide utilities with dedicated electric power generation capacity to utilize for demand response purposes, and 3) provide customers with the most dependable standby power in the industry. PowerSecure also provides utilities with transmission and distribution infrastructure construction and maintenance services, and engineering and regulatory consulting services. Additional information is available at www.powersecure.com. Want to Learn More about Microgrids? Here are some resources to help you get up to speed quickly on the leading applications of microgrid concepts in both military and civilian applications. These lab experiments are giving customers choices about their energy future and enabling new technologies much faster than waiting for he roll out of smart meters and the inevitable hassles over dynamic pricing and the other regulatory rules of the road yet to be developed. If you know of other microgrid resources please add a comment to this post with a link to them. The Consortium for Electric Reliability Technology Solutions (CERTS) was formed in 1999 to research, develop, and disseminate new methods, tools, and technologies to protect and enhance the reliability of the U.S. electric power system and efficiency of competitive electricity markets. CERTS is a Department of Energy/California Energy Commission-led group focused on inverter technologies to allow the fast, safe disconnection and reconnection of microgrids to the larger grid essential to allowing microgrid power to serve as backup and stabilizer for the grid. CERTS systems as among the first to standardize microgrid-grid interconnections. RESCO: “Renewable Energy Secure Communities,” is a project funded by the California Energy Commission (CEC) at UC San Diego to integrate on-site renewable energy production. UC San Diego’s campus-wide microgrid is one of the most technologically advanced in the world serving a 1,200-acre, 450-building campus with of 45,000 people with two 13.5 megawatt gas turbines, one 3 megawatt steam turbine and a 1.2 megawatt solar-cell installation providing 82 percent of the campus’s power requirements. The RESCO project at UC San Diego is funded by a $1 million grant from the CEC and $1 million in matching funds from the University of California/California State University/Investor Owned Utility Partnership Program. The Galvin Electricity Initiative is a campaign to transform our nation’s power system into one that truly meets our needs for reliable, efficient, clean electricity service. Initiative founder Bob Galvin, the former CEO of Motorola and a leader in the application of Six Sigma quality standards, bases this vision on the fact that top quality always produces the lowest cost. The imperfect quality of power service today robs each American household of thousands of dollars a year, and the transformation of service quality to 21st century digital standards is critical to resolving the serious economic and environmental threats facing our nation. The Initiative believes that these threats can only be resolved if we shift to a new industry paradigm that is consumer-centric and driven by entrepreneurial innovation and smart technology. Fast Company: Why Microgrid could be the Answer to Our Energy Problems. While microgrids will not be the answer for everyone the experience to date suggests privately owned, consumer-driven, small-scale, geographically distributed renewables could enable many customers to be energy self-sufficient or even be net metering suppliers to the power grid delivering 100% renewable energy faster and cheaper than utilities. Pike Research Microgrid Market Advisory Services. 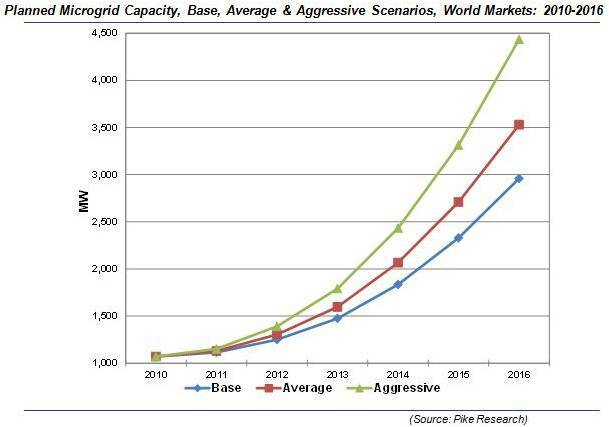 Pike Research provides a regularly updated view of the market size and potential for microgrids and is also a convenient way to track new vendors as well as military and other business applications of microgrid technologies. Nexant USAID Microgrid Research and Development. One of my clients, Nexant, has for many years managed a contract for US AID to help African countries make use of microgrid technology to bring energy, water supply and other public health and safety services to remote villages. They also provide consulting services to private companies interested in microgrid development. For more information on Nexant microgrid services contact Doug Welsh, Vice President-Power Services at Nexant at 480-768-6993 at his office in Chandler, Arizona. This entry was posted in Business Models, Electric Power, Product Strategy and tagged distributed generation, Efficient energy use, microgrid, PowerSecure International, smart grid, Wheeler Army Airfield. Bookmark the permalink.